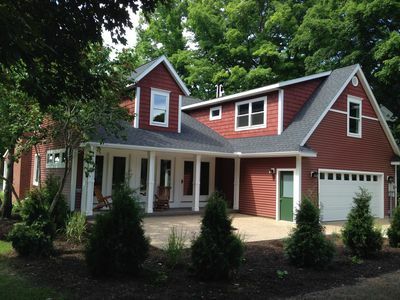 Charlevoix In-Town Classic Cottage by the Library . 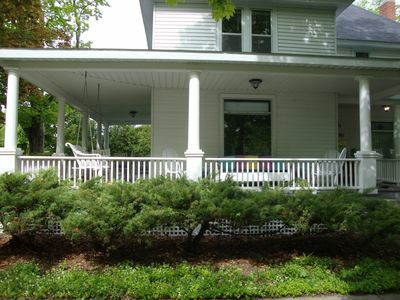 . .
206 Clinton Cottage is a delightful Charlevoix cottage right in town. 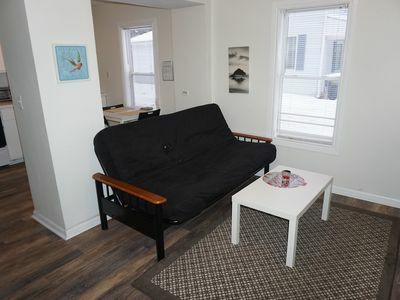 It is a short walk to Lake Michigan Beach, Round Lake, the Library, the Bridge, downtown restaurants, shopping, grocery, movies, bike rental, and the like. 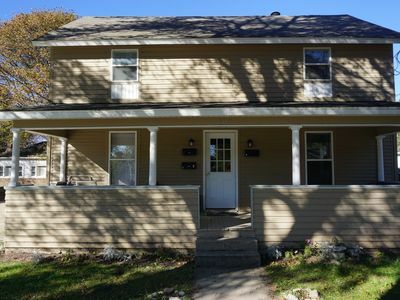 206 Clinton Cottage is a charming home with all bedrooms on the main floor. The 'blue' bedroom, has a queen bed and adjacent bath with shower. A second bedroom, the 'green' room, has a set of twin beds and attached full bath. The 'yellow' bedroom has twin beds. 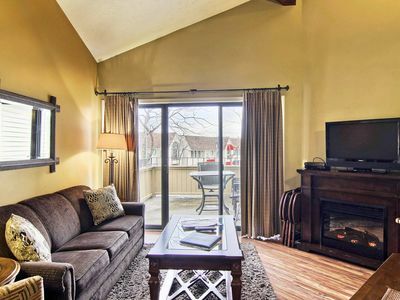 Cable TV's in all bedrooms. The kitchen is fully equipped. 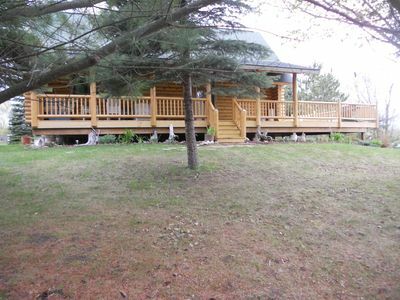 There is a deck off the kitchen/breakfast room with a grill and seating. 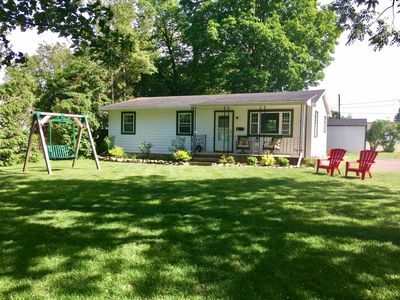 The house has central air, laundry facilities, and a driveway that will accommodate several cars. 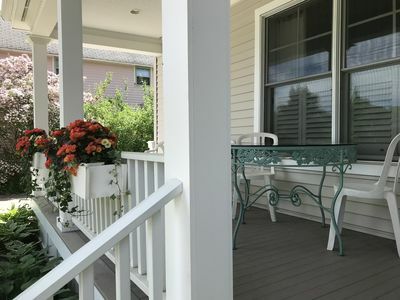 Enjoyable and lovely is the front porch - a nice spot for relaxing. Downtown Charlevoix and the Marina are bustling with activity, including concerts and various art festivals. 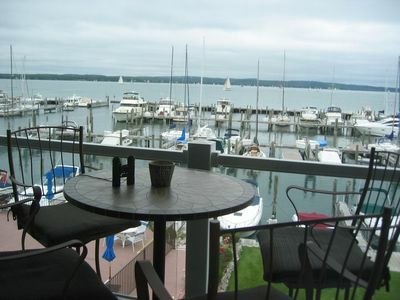 Charlevoix is a good base to take day trips to Petoskey, Traverse City and Beaver Island. 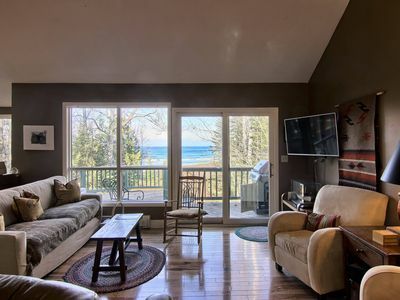 Come and enjoy the beauty of Charlevoix and Northern Michigan. House rental, Saturday to Saturday turnover. 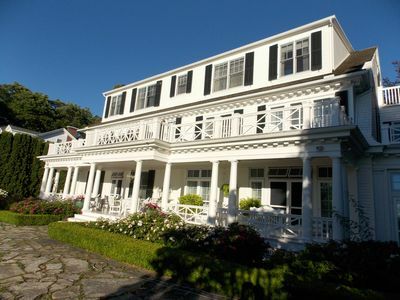 House rental rate is $2,600, up to seven days. The weeks of July 4th and Venetian Festival have a rate of $3,000. We welcome multiple week rentals. No pets or smoking in the house. 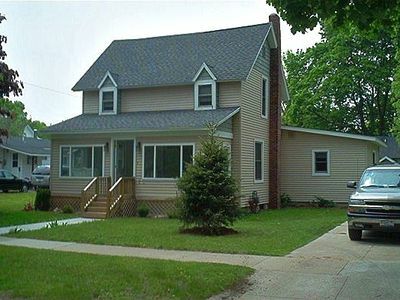 Contact owner for questions, 248-709-2411. 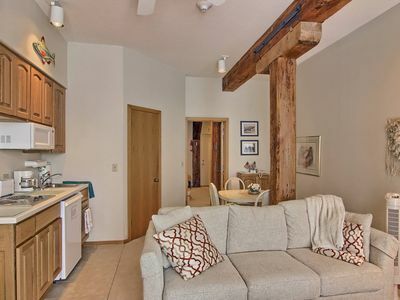 Keywords: cottage, in town, main floor living. 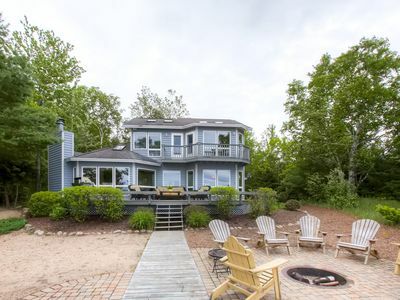 Enjoy Lake Michigan Waterfront while sitting by the fire and watching sunset! Call About Our Summer Special! 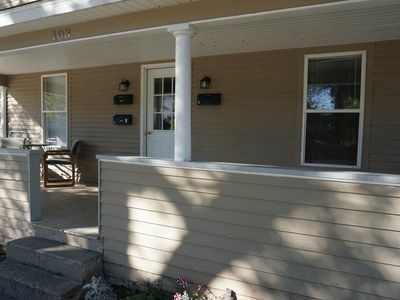 3 bed 2 Bath House or 1 BD Cottage. Great Price! 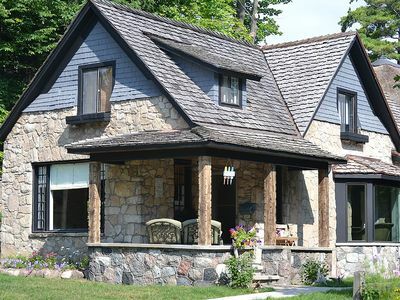 Charlevoix Mushroom House, The Cottage. 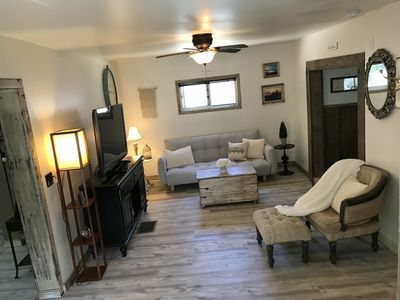 Close To Downtown, 1 Block To The Beach. 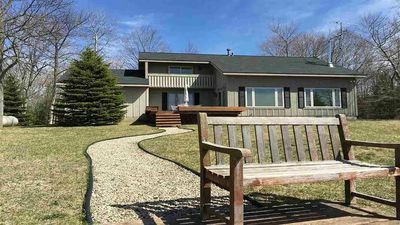 Enjoy Lake Michigan at this 3 Bedroom, 2 Bath Home Just South of Charlevoix! View of Round Lake & 1 Block to Town in downtown Charlevoix! 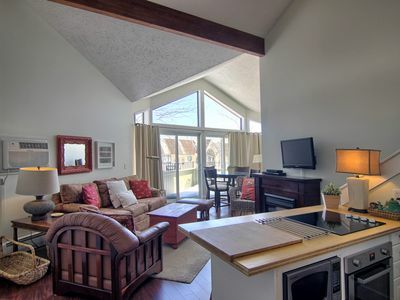 Why rent a room, when you can stay in a suite in downtown Charlevoix? 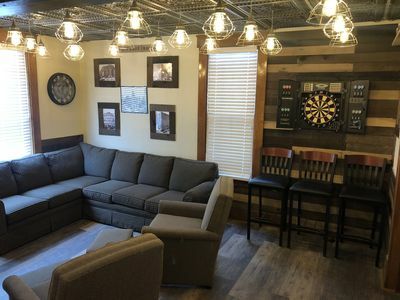 New Rental Location - Next Door To Dairy Grille and 4 Blocks From Downtown.